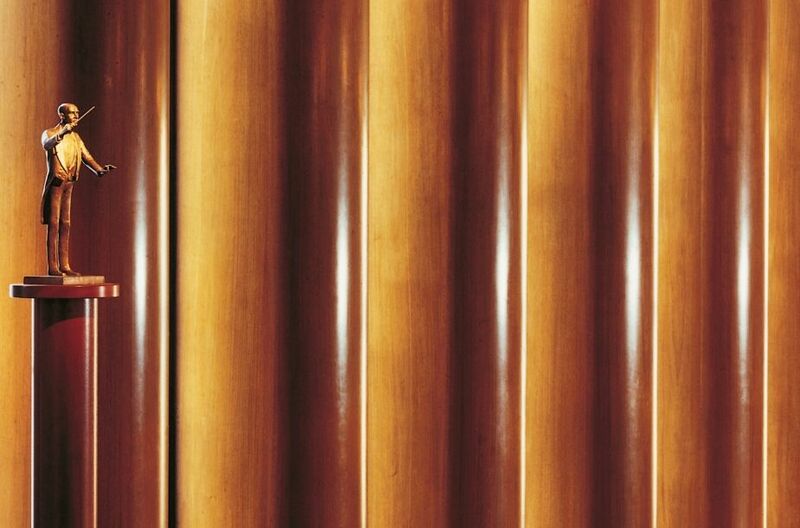 Join us on a tour through all the winding nooks and crannies of the Gothenburg Concert Hall. 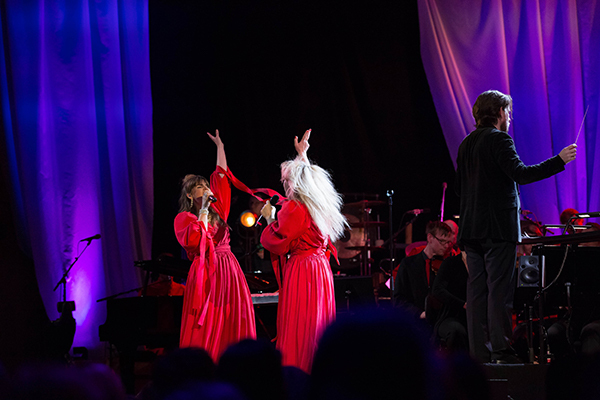 The Gothenburg Concert Hall has been adapted to be accessible to everyone. For instance, we have wheelchair spaces in the concert premises and hearing loops with IR transference. Inside the walls of the Gothenburg Concert Hall, there are many artistic treasures on which to gaze. The furniture in the entrance hall was specially designed by Nils Einar Eriksson, the architect, in collaboration with Axel Larsson. The carpets and furniture fabrics were created by Inga Wedel, and the attractive drinking fountain has been newly produced by Orrefors, following the original plans by Simon Gates. The sculpture above shows composer Wilhelm Stenhammar, chief conductor of the Gothenburg Symphony from 1907 to 1922. 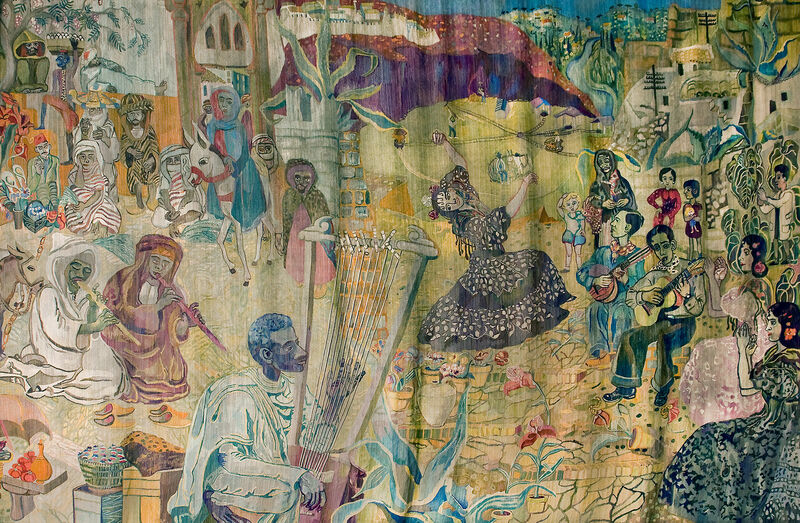 (Melodies at the Market), 1936, tapestry, 6.40 x 9.20 m (approx.). Artist: Sven X-et Erixson, (1899-1970), painter and sculptor. The artist’s pictures have their roots in a naivist and narrative tradition. He became renowned during the 1930s for his colourful depictions of the city and of work. Many of his lithographs received widespread distribution through the publications of Konstfrämjandet, an organisation for the promotion of art, during and after the 1940s. Training: Tekniska skolan (the Technical School), Stockholm, and the Royal Institute of Art, Stockholm. Professor at the Royal Institute of Art, 1943-53. Public works of art at: Heliga Korsets kapell (the Holy Cross Chapel) at Skogskyrkogården, the Woodland Cemetery in Stockholm, Uppsala City Theatre, and Huddinge City Hall, among other locations. Displayed at Nationalmuseum (the National Museum in Stockholm), the Moderna Museet art museum, Waldemarsudde, the Gothenburg Museum of Art, the National Gallery of Denmark, Copenhagen, and the National Gallery, Oslo, among other institutions. 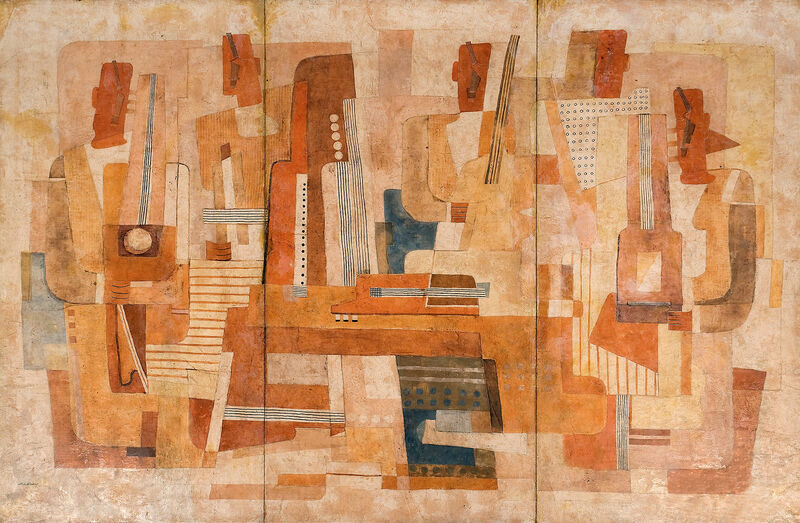 (Musicians), oil painting on panel, 230 x 330 cm, 1938. Donated in 1997 by Sten A. Olsson and the Wedel family. 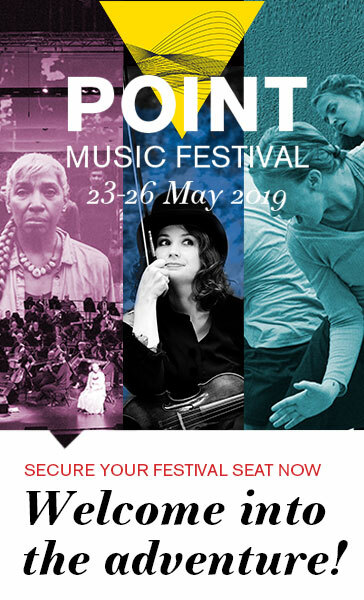 A cubist inspired composition, representing a number of musicians and their instruments. Located in the foyer outside the Stenhammarsalen concert room. Artist: Nils Wedel (1897-1967). Painter, graphic artist and craftsman. White marble bust, 1939, 48 x 32 x 27 cm (h/d/w). 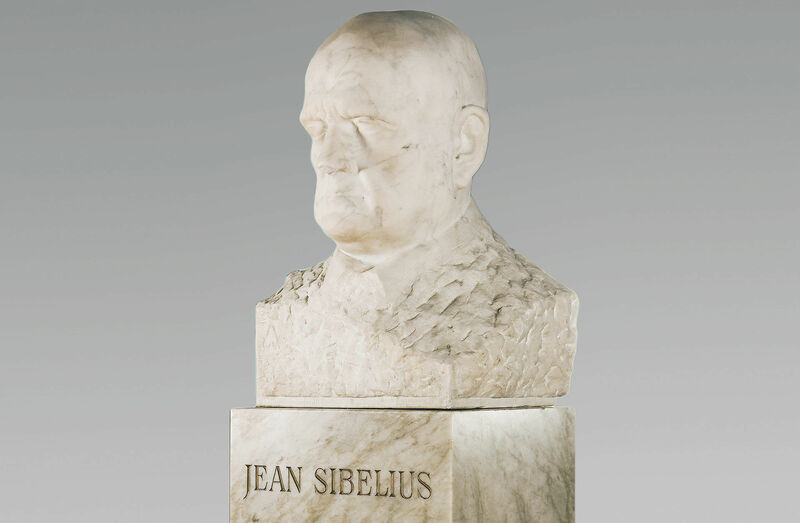 Jean Sibelius (1865-1957) is considered to be one of Finland’s foremost composers. Sibelius composed seven symphonies and several orchestral works. Among his most famous works are “Finlandia”, “The Karelia Suite” and “Valse triste”. He visited Göteborgs orkesterförening (the Gothenburg Orchestra Society) as a conductor during the period that his friend Wilhelm Stenhammar was in charge of the orchestra. Artist: Wäinö Aaltonen, (1894-1966) sculptor and painter. One of the foremost artists in Finland during the first years of independence. Aaltonen made several large commissioned works, including bronze figures for the Parliament Building in Helsinki during the 1930s. The Wäinö Aaltonen Museum of Art in Turku is the city museum of Turku, and a major part of its collection consists of Aaltonen’s own donation. There are 11 outdoor sculptures by him in Turku. In Gothenburg, a twin town of Turku, it is possible to see, in addition to this portrait, the monumental sculpture “När vänskapsförbindelser knyts” (When Friendships are Made), located at Näckrosdammen, which represents a young man and a young woman on horseback. A copy of this work was unveiled the same year (1955) in Turku. The work was donated to the twin town as thanks for help during the reconstruction of Turku after the war. © Wäinö Aaltonen /BUS 2009. (The Folk Song), fresco painting (al fresco), 1937. Approx. 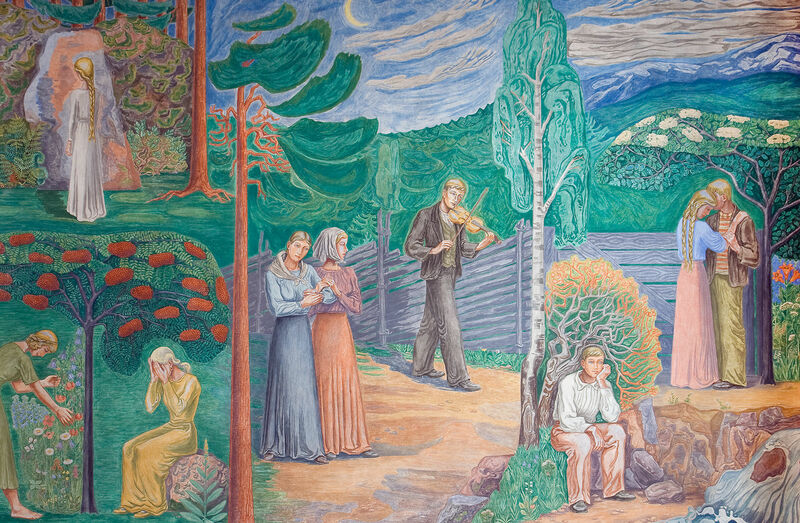 6.4 x 9.5 m.
The picture depicts in a few scenes the Nordic landscape and its people. The minor-key music from the player’s fiddle seems to reflect the mood of the people. A young man is sitting and looking at (and listening to) the gushing water of a stream. A loving couple stand close together under a white-blossoming tree. The picture becomes an antithesis to the more cheerful picture (by Sven Erixson) on the opposite wall. The al Fresco technique has been used since the late Middle Ages and involves painting with pigments dissolved in water on wet plaster, which causes the pigments to combine with the plaster and makes the picture very durable and resistant to fading. Artist: Otte Sköld, (1894-1958). Painter, drawer and graphic artist. Otte Sköld first painted in a Cubist style, but moved on to a more detailed style in his still lifes and portraits. His pictures of music hall and café settings are perhaps those that he has come to be best known for. Together with Åke Pernby, he created Otte Skölds målarskola (Otte Sköld’s School of Painting), in 1929. In the period 1938-42, he was a professor at the Royal Academy of Fine Arts in Stockholm, where he later became a director until 1950. During the period 1950-59, Otte Sköld was the director of the Nationalmuseum (the National Museum in Stockholm), and during the period 1958-60 he was also the first director of the Moderna Museet art museum. Otte Sköld is displayed in most of the large museums in Sweden and Scandinavia, and can also be found in the collections of a number of museums in Europe. © Otte Sköld /BUS 2009. 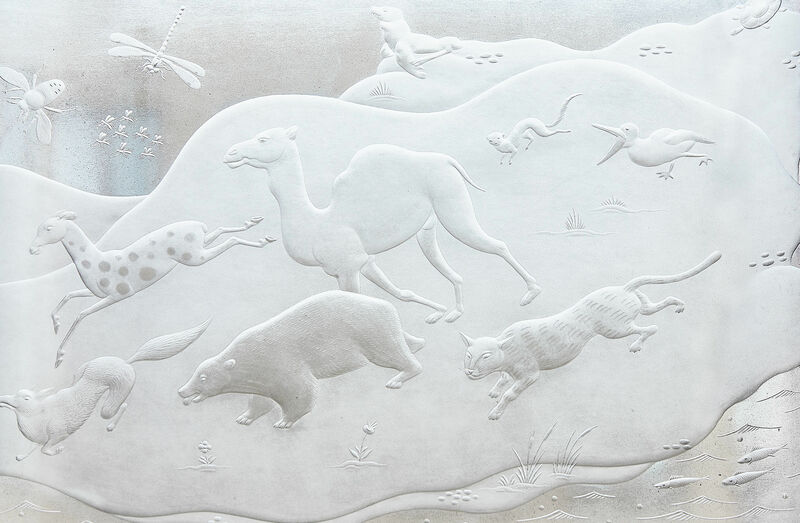 (Animals), three glass reliefs (engravings), 1935, 20 x 26.5 cm. A very well-worked and imaginative picture of many different animals which are all rushing towards the music made by a man playing the lyre, where the animals then find peace.